The other day I mentioned that I am going to rearrange and reorganize some stuff in my basement. Starting with moving the pantry. 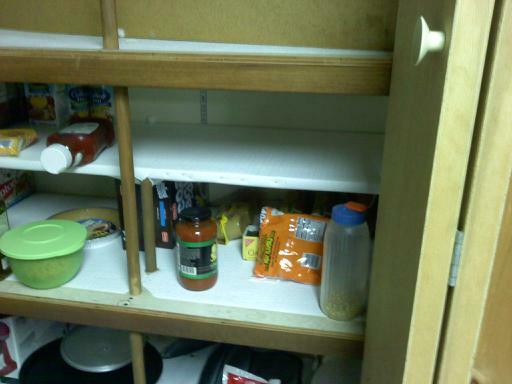 Currently, our pantry is in a big closet in the basement, across the room from our chest freezer. 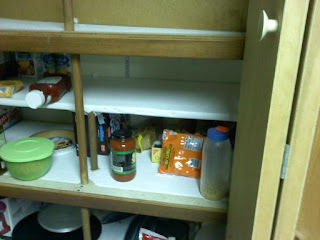 I decided that it made better sense for the pantry to be closer to the freezer, keeping all food in the same area. The closet is a built in, so there's no moving that. 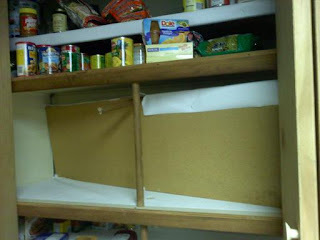 So, I'll be moving the food into 2 pantry cabinets that I will put next to the freezer. In order to move the cabinets, shelving and all that, I have to remove EVERYTHING. All the food, all of my appliances (toaster oven, roaster, mixer, etc. ), EVERYTHING. I started a bit on Monday night. And got a bit further yesterday. I removed about half of the stuff from the pantry and I'm running out of room to put it while I clear the rest of the stuff and start the moving of the cabinets. Here's a picture of the closet that currently holds our pantry stuff. This is not how it normally looks, I had already started moving things onto a folding table and moving things to lower shelves to remove some of the shelves to store bigger items. Yesterday, I thought I'd be able to remove the shelves myself. I only got so far and then realized that the previous owners installed the shelves and then put the frame and doors on the front of the closet. So the shelves wouldn't fit to come out, until Joe cut them. He removed them last night after dinner. Now, with some of the shelves removed, this will be the new home of my kitchen appliances that do not fit in my kitchen. The crock pots, rice steamer, electric frying pan, etc. will all be stored in this closet. Along with some of the dishes that we don't use everyday. I can't wait until Grace takes her nap today! Right now making these changes may seem like a nightmare. If you are anything like me, half way through this project you are going to sit there and think, what the heck have I started? I do that often. The pain, frustration, and aggravation will be well worth it. The convenience alone will be wonderful!! You will have to post a follow up!! Awesome job! !